The Cumbres & Toltec Scenic Railroad is offering half-price tickets to all residents of Taos, Santa Fe and Española. 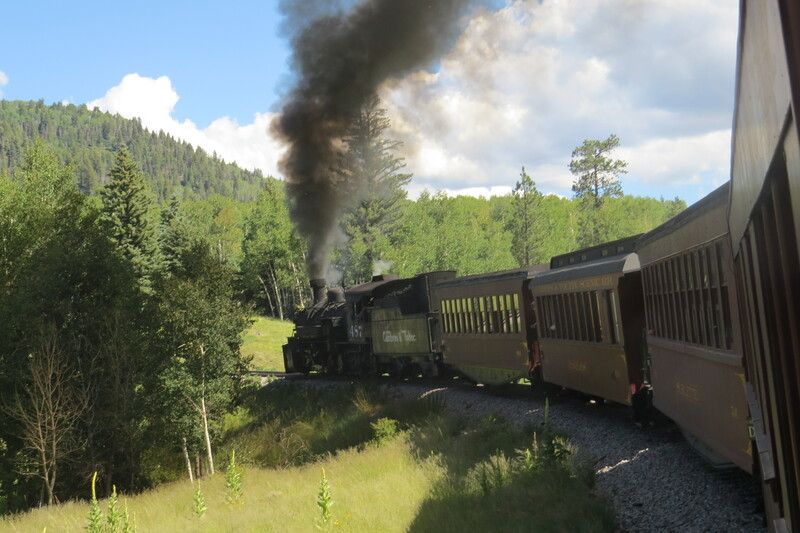 From August 17th to the 31st, northern New Mexico residents have the opportunity to take a ride back in time, enjoying a railroad built in the 1880’s and a train pulled by an old but totally functioning steam engine. Train engineer Jeff Stebbins explained that the engine was made in 1925 by Baldwin Locomotive Works in Philadelphia. There are always four crew members on each train—the engineer, who runs the engine and the train; the fireman, who shovels the coal and makes sure that there is sufficient water in the boiler; the conductor, who is in charge of the entire train operation, and the brakeman, who works closely with the conductor. Jeff Stebbins isn’t a railroader by trade either, but has been fascinated with steam trains since his youth. After working as an electrical engineer in the oil fields for twenty-three years, he began as a fireman in 1996 and later became a train engineer on the Cumbres & Toltec Railroad. “Once the passion for trains gets in your blood, you just can’t get it out,” he said. The train has no computers and no GPS or recorders, which is precisely what Stebbins likes. “You actually need to use your brain to operate it,” he said. 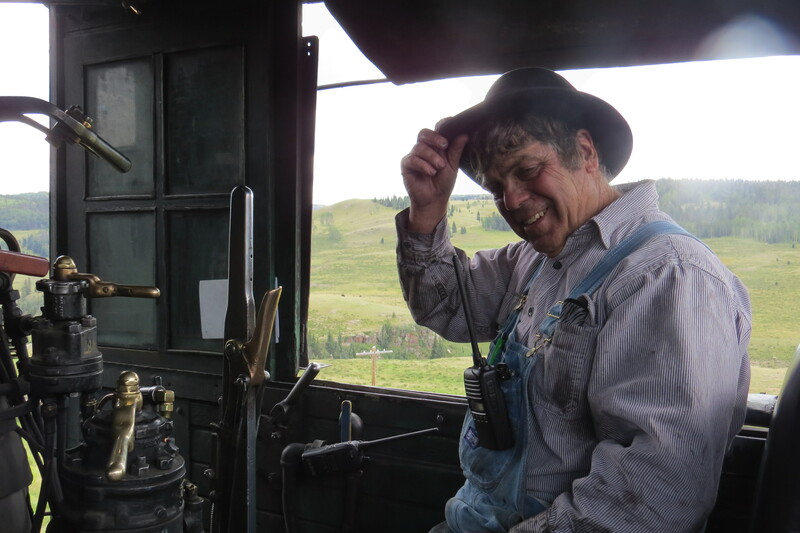 In every Cumbres & Toltec train there is a docent—a knowledgeable guide who answers passengers’ questions and points out interesting sites along the way. One of them is Laura Lusk, a retired National Park Ranger who used to work at Canyonlands. There is also a motor car operator who precedes the train to check for rocks and mud slides. Julian Martinez has been doing that for over 33 years at Cumbres & Toltec. The two trains leave daily from Antonito, Colorado and Chama, New Mexico and meet at Osier for lunch. There are three kinds of accommodations. The most popular and budget-friendly ride is in the Coach car with old style, comfortable benches seats. The Deluxe tourist car has individual seating, with tables that resemble a restaurant, and the Parlor car has a lounge style room with panoramic windows. Everybody is welcome in the gondola, or open car, ideal for great photo shoots and wildlife viewing. There is an ADA compliant car for passengers with disabilities. The lunch at Osier Station, at 9000 feet of elevation, is provided by Toltec Gorge Catering. It is included in the ticket price and passengers have a choice of turkey “with all the fixings,” meatloaf or soup and salad bar, plus a variety of desserts. The dessert menu features apple pie, pumpkin pie, brownies, bread pudding, chocolate cake, and fruit tarts. The original tracks were built with a gauge of 3 feet between the rails, instead of the 4 feet, 8 and a half inches that were used in the rest of the country. But the difference in measurements didn’t allow their trains to interchange cars with other railroads. This disparity, combined with the silver mining industry decline, contributed to the abandonment of many narrow gauge tracks more than half a century ago. It wasn’t until 1970, when the states of Colorado and New Mexico jointly purchased the structures from Antonito to Chama, nine steam locomotives and more than a hundred cars, that the railroad began functioning again. “Now it is a living history museum,” said Bob Ross, one of the directors with Friends of the Cumbres & Toltec Scenic Railroad Inc., a nonprofit organization dedicated to the preservation of the railroad. Besides the current promotion for northern New Mexico residents, other discounts include the “kids ride free” special: children from ages two to twelve get a free ticket per paying adult, in the coach car. It doesn’t include lunch, though. This promotion is available until September 12th. There is also a 10% discount on tickets for active and retired military, a 10% AARP discount and a 10% AAA discount. Martha Jean-Pierre is from Santa Fe and takes a Cumbres & Toltec ride at least twice a year. Peggy Curtis is from Lincoln, Arkansas. She had been looking forward to the ride and was enjoying it. To find out more about the Cumbres & Toltec Scenic Railroad rides and schedules, visit the website http://cumbrestoltec.com/ or call the railroad at 1-888-CUMBRES.